Important: In addition to using these steps below you can also choose to configure your Socket Mobile Scanner for your iPad using Socket Mobile's Companion App. Click this link to download the App. 1. Press and hold the small power button until the LED turns blue, and it beeps twice (it will beep low and then high). 2. Your Socket barcode scanner is now powered on. For use with the iPad, you'll want to set the scanner to iOS mode. The scanner will automatically add your Vend products to a sale if iOS mode is running. Tapping other fields during iOS mode will open the on-screen keyboard. To enable iOS mode, print this page and scan the below barcode. The scanner will beep 3 times to confirm the mode change. Tip: Try scanning the following barcodes directly on the screen, if it does not work, print off this page and scan it from there. These barcodes will also be in the manual that came with your socket mobile scanner. 3. Next, head to your iPad and tap the 'Settings' icon to open the Settings App. Tap the 'Bluetooth' menu to open the Bluetooth settings. 4. Turn Bluetooth on. Your iPad will search for available devices to connect with. Once it locates the barcode scanner, Socket CHS, tap it to connect. Your scanner should now be all set up and ready to go. To test that it is working correctly, open the Vend Register app and scan a product barcode that has already been added in Vend. Scanning one of these products should automatically add it to your sell screen. Having trouble connecting your scanner? If the scanner is appearing in the Bluetooth list on your iPad but not connecting, tap the 'i' icon and choose 'Forget This Device'. Next, hold down the two top buttons on the scanner until you hear 3 descending tones. You've now successfully unpaired the scanner. Try to pair it again using the above steps. 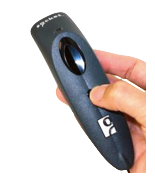 Using the barcode scanner for scanning product, customer, and receipt information? You can also put your socket mobile into 'Keyboard Mode'. Putting your scanner in 'Keyboard Mode' will allow you to scan the product, customer, and receipt information into places other than the sell screen. Using this mode requires you to tap the correct field before scanning the barcode and delete the content in the field (for example, the customer search or product search field). Reconnect your scanner to the iPad via Bluetooth. Tip: This mode treats the scanner as a keyboard. If you need to access the standard on-screen keyboard, double-click on the scanner's power button. If both your iPad and Socket Mobile scanner are left unused for long enough, they will enter sleep mode. When the Socket scanner goes into sleep mode, it will be disconnected from the iPad. To reconnect your Socket Mobile scanner to your iPad, make sure that the Vend Register app is up and running and turn on the scanner as normal. Once you've done this, the scanner will take up to 30 seconds to automatically reconnect. It will beep when that happens.